A well-crafted story, well-acted and well-designed. The man behind the robot crime wave is revealed a bit too early, but that really doesn’t detract much from the overall quality. We have a very fine opening scene showing the crew at leisure. Their interaction reveals their individual personalities, the tensions between them, hints at the sort of culture they come from, and indicates their dependancy on robots. And it manages all this quite gracefully and without being obviously expository. We then have a contrasting scene showing the TARDIS “crew”, also at leisure. Leela is playing with the yo-yo, although she doesn’t realize she’s playing. One can imagine that Leela, new to the TARDIS, has a million and one questions of the Doctor; he’s given her the yo-yo as a distraction to keep her out of his hair. There’s an awkwardness between them — the Doctor, in particular, doesn’t seem keen on her company, but is resigned to being her mentor. These two scenes set up the situation to follow, and do so with both style and an economy of words — an admirable bit of writing. We get two different versions of the scandal in Uvanov’s past. Wonder which one is the truth? While on the topic of robots, there’s an interesting scene with D-84 and the Doctor: Leela is clearly heard in the background, crying out for help from the locked lounge room; D-84 startles the Doctor, who cries out himself, D-84 says “I heard a cry”; Doctor responds “That was me”. The conversation is repeated 3 0r 4 times. The Doc still doesn’t have much respect for Leela’s hunter-warrior skills, but he’s starting to learn. She’s able to perceive things he can’t, such as the imminent danger to the mining vessel. His resentment towards her shows on many occasions, such as when he continues to call her “mouse” even after her helium-affected voice is back to normal. Who has more to learn, the Doctor or Leela? Leela!!! That one name should say it all, but I guess I’ll need to write a bit more. Good serial, with an interesting situation caused by the Doctor himself. Granted, the last episode drags a bit, but the introduction of the wondrous Leela makes up for just about everything this tale may lack. The Doctor’s face carved into a mountain, ala Mount Rushmore. When I first watched this serial, that was a real shocker. Leela puncturing the Doc’s ego by suggesting the entrance way into the mountain is through the sculpture’s nose. The Tesh leader, so outwardly calm — and, when no one can see, pounding his fist in frustration. Judging by the skimpy outfits of the tribe, this is area has a hot climate. But the Doctor wears his heavy coat and scarf all the way through without breaking a sweat. What I deduce from this is that the Sevateem are used to female warriors and have no particular problem with women in authority, which further means that we should be seeing a few of them out and about, participating in tribal councils, and so forth. Where are they, then? The Tesh have no women in sight, either. Given the Tesh asceticism, they might be segregated from the male population. I’m assuming that the Tesh do, indeed, have females, unless they’ve developed a way to reproduce asexually — but that really wouldn’t help Xoanan’s eugenics experiment, and probably wouldn’t be allowed. This issue was brought up in the DVD commentary, with the explanation that it was due to budget restraints. I don’t get it — are female extras more expensive? A new companion, her name is Leela, and, as you’ve probably guessed, I think she rocks. She’s a maverick from the very beginning, and it’s not surprising she should run off with the Doctor, even if he doesn’t really want her. Leela had outgrown her tribe even before the Doctor came into her life, and she knows he’s the way into a new world. They’ve got a mentor / student sort of relationship, and it will be interesting to see how it develops. This serial does have some very fine moments, but, personally, I find it lacking. Maybe it’s the lack of a companion, or maybe it’s the over-long Matrix sequence or maybe it’s the de-mystifying of the Time Lords (although, in the long run, that was probably a good thing) — for whatever reason, I can’t get too enthused about this story. First sight of the Master’s face – yeah, creepy. See, boys and girls, that’s what happens if you don’t live right. Scary, laughing clown. ‘Nuff said. The costuming — sets weren’t so great, but costumes were inspired. We get a good feel for Gallifreyan culture just by looking at them. And, what’s more, this isn’t much of a democracy. The President normally appoints his successor; elections only occur when he doesn’t. And who is allowed to vote, I wonder? We can see clearly why the Doctor left town. 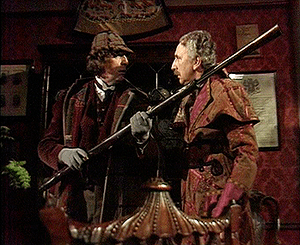 Not much to ship here, except the ongoing Master-Doctor hate/love relationship. (I’m sticking with my theory that the origins of the Master’s hatred is unrequited love) Poor, old Master has become quite mad by now — an evil life will do that to you –and he’s not satisfied with killing the Doctor, he wants to destroy his reputation, too. Of course, he fails, but it’s not all for naught, as he actually succeeds in renewing his life energy to live a while longer. Crime does indeed pay, once in a while.